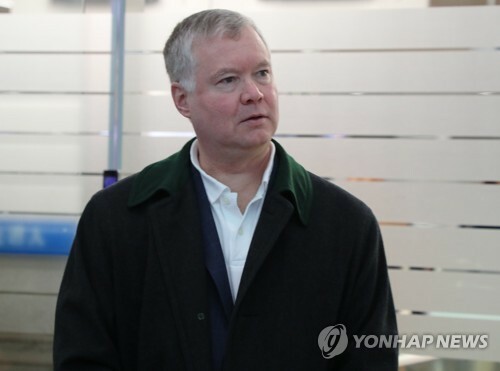 United States Special Representative for North Korea Stephen Biegun departed Seoul on Sunday after returning from three-day talks in Pyongyang. Biegun boarded a flight home on Sunday morning at Incheon International Airport after meeting senior officials of South and North Korea last week. When he returns home, the U.S. envoy is expected to report on the results of his trip to Pyongyang to U.S. Secretary of State Mike Pompeo and prepare for follow-up negotiations with the North. The U.S. State Department said on Friday in a statement that Biegun and his North Korean counterpart Kim Hyok-chol will meet again ahead of the second summit between President Donald Trump and North Korean leader Kim Jong-un. Accordingly, the two sides are expected to hold additional talks in Washington, Pyongyang or Hanoi, Vietnam or at the inter-Korean truce village of Panmunjeom in the near future. Biegun flew back to Seoul on Friday evening following a three-day visit to Pyongyang aimed at fine-tuning preparations for the second North Korea-U.S. summit scheduled for February 27th and 28th in Vietnam.